While Zato can support AMQP, WebSphere MQ, ZeroMQ or FTP as well, the majority of environments will use the ubiquituous HTTP protocol only and this post describes the traffic patterns within a typical HTTP-only cluster consisting of a load-balancer, web admin, Redis, SQL ODB and two servers, right after it's been installed without any user-specific customizations. Please refer to the Zato's architecture overview for a refresher on what role each of the components fulfills. In order to ensure high-availability (HA), incoming HTTP traffic is always routed through a load-balancer that distributes the load in a fair manner across the servers so that outside client applications don't access the servers directly and are never concerned if any of the servers is unavailable. Servers always invoke external HTTP resources directly, from the systems they are installed on. Servers never communicate directly with each other. If any server needs to send a message to another one, it's always done in an indirect manner using publish/subscribe with Redis. Redis is also used by servers to store volatile or highly dynamic data, such as usage statistics, frequently accessed runtime configuration or user caches. 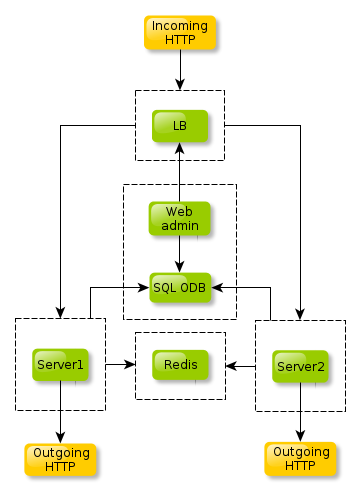 SQL ODB (Operational Database), which as of Zato 1.1 needs to be either PostgreSQL or Oracle, stores information that benefits from being kept in a relational database, usually data that needs to be always saved on disk as promptly as possible and shouldn't be stored in RAM first, as with Redis. Web admin is a GUI used to manage Zato environments. Being based on Django, it connects to SQL ODB in order to store a few parts of its configuration but the vast majority of its functionality is merely a frontend that connects to servers, through the load-balanacer, to invoke the public API servers expose. In other words, this is a frontend only. 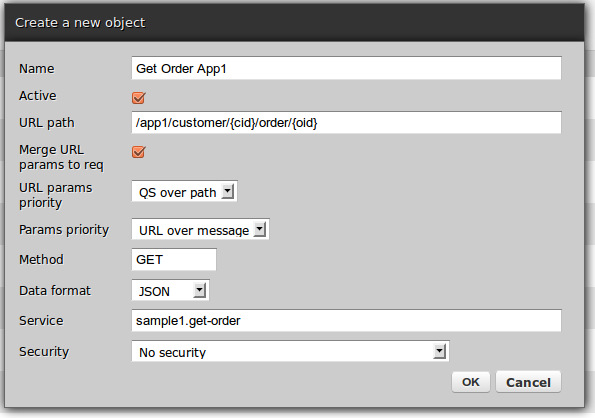 Users are encouraged to use the API to create their own alternative frontend apps. Arrowheads in the diagram represent the exact directions the traffic will follow - for instance, servers don't send messages to the load-balancer nor the latter will invoke Redis thus the arrows don't point in these directions. 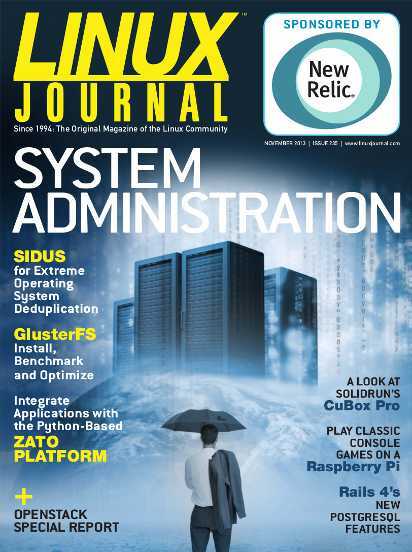 Linux Journal has just published a free version of the Zato article originally written for the November 2013 issue. 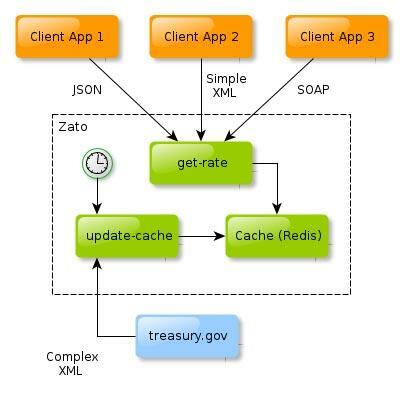 Atomic and goes through the process of developing a sample integration using financial APIs of treasury.gov. A Zato ESB and application server feature that has just been added on GitHub is an HTTP access log. This is an additional log to what has been already available in regular server logs and keeps nothing but information regarding HTTP requests in a format used by Apache httpd. This makes it possible to use existing tools in order to parse and extract interesting information out of the logs. The log is kept in each server's ./logs/http_access.log file. For instance, if a server is in /opt/zato/server1, the log will be in /opt/zato/server1/http_access.log. 10.151.19.27 K070053855728592769928224227915635470962 "zato.ping" [12/Jan/2014:20:11:53 +0100] "GET /zato/ping HTTP/1.1" 200 141 "-" "curl/7.22.0 (x86_64-pc-linux-gnu) libcurl/7.22.0 OpenSSL/1.0.1 zlib/1.2.3.4 libidn/1.23 librtmp/2.3"
Remote address 10.151.19.27 Address of the application issuing the request, X-Forwarded-For is used, if present, otherwise IP address of the client application is used. Timestamp [12/Jan/2014:20:11:53 +0100] Timestamp of the request. In local timezone by default but can be changed to UTC if need be. A feature that has recently landed in git master on GitHub and will be released in 2.0 is the ability to log into Zato's web-admin using OpenID. This lets one make use of an already existing Single Sign-On (SSO) infrastructure instead of requiring Zato admins to memorize additional credentials. No restarts are needed after updating a given user's credentials. Note that enabling SSO disables regular password based authentication. To revert to the latter, set OPENID_SSO_SERVER_URL to "" and restart web admin. It has been possible to create reusable REST services in Zato right from the release 1.0 however a feature that recently landed in GitHub and that will be released in Zato 2.0 makes it easier to use of RESTful URLs, also known as clean URLs. This blog post presents HTTP channels and an upcoming one will deal with HTTP outgoing connections. The diagram below depicts what we'd like to achieve - 3 independent applications invoking the same service yet each using separate URLs. To keep it simple, let's say we want to return a customer's order in JSON. 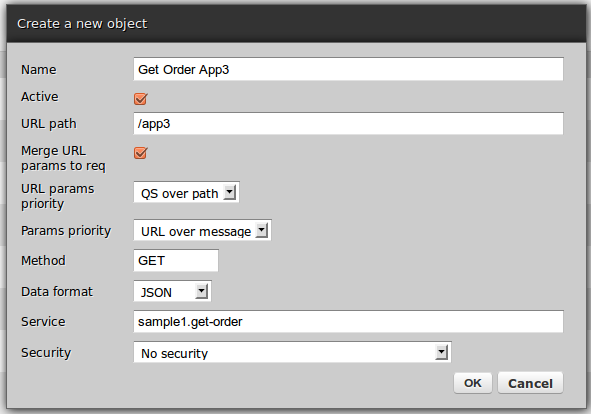 App3 uses GET and sends parameters in query string, e.g. /app3?cid=111&oid=222 Each of them should invoke the same reusable service that should receive parameters on input without any changes to the code regardless of which application invokes it. This is how the service we're exposing will look like. Note that for clarity, the same response is always produced though input data is copied over so we can quickly confirm on command line they were indeed received by the service. Also note that we make use of SimpleIO - a declarative syntax for expressing I/O parameters that lets one use Python dictionaries, bunches or SQLAlchemy objects directly in order to forget about manual serialization - no matter if it's JSON or XML/SOAP, though only the former is used in this post.
""" Returns details of a given order. The service can be hot-deployed in the cluster and we can expose it through channels. 3 separate HTTP channels for each of the applications. Having deployed the service and created the channels, we can proceed to invoking the services. Note that no restarts are required. JSON output has been slightly reformatted for clarity. We couldn't use the built-in service invoker GUI as this bypasses channels altogether and while it is in fact a great help in development, it can't really be used here when the gist of the matter are channels themselves. 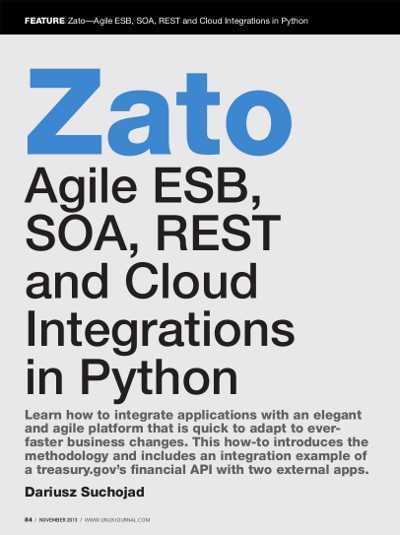 RESTful channels expand means through which reusable Zato-based services can be exposed to external applications. The feature is slated for inclusion in 2.0 and is already available from GitHub, in the master branch.